Pongamia pinnata, also known as Karanja or Indian beech, has been useful in traditional medicine for centuries. The root, stem, leaf, fruit, seed, oil, bark, and flower are used to treat many ailments, ranging from mild colds to tumors. Pongam, a glabrous tree, is primarily found in forests of India. The tree grows in tropical and sub-tropical regions all over the world. This angiosperm grows to be anywhere between 30 and 75 feet tall. It's considered to be one of India's brightest, richest trees. This tree is not only useful in the medicinal world but also in the economical world. 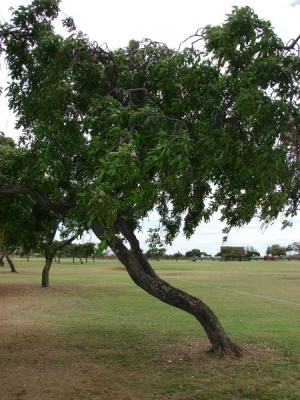 Visit the facts page to find out about how this tree is useful in environmental management, in agriculture, and as a potential biodiesel source. Learn about the taxonomy of the Pongam tree. Check out more organisms from the Multiple Organisms website! Header photo taken by Tatters :) and can be found here.